Sea Breeze Cove is the fourth world and island in Donkey Kong Country: Tropical Freeze. It is opened once the Kongs beat Ba-Boom in the previous world, Bright Savannah. The boss of this world is Fugu, the Frightening, a blowfish foe whose main characteristic is an extreme ability to increase its body capacity with water. Despite its name, the Sea Breeze Cove is actually set in an archipelago, as its map highlights. Its levels either take place on coastal land above water, or start off on land but take place mainly underwater. Many aquatic enemies appear throughout the world, including first-time enemies such as Fritz and Mama Saw, which are based on real-life electric eels and sawfish, respectively. Squiddicus makes a comeback after Donkey Kong Country Returns, in a stage called Irate Eight. Primary ornamental features of Sea Breeze Cove are the the large stone statues, testimony of a fictional ancient civilization. Some protrude from the beach sands in the background, while other are sunken underwater. 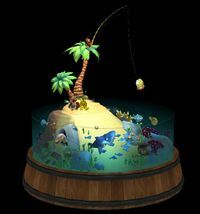 In a level called Rockin' Relics, these statues are powered by electricity, making sudden movements that propel various objects in the air. The statues can also be seen in what looks like a lofty underwater ancient corridor in High Tide Ride. According to Retro Studios artist Eric Kozlowsky, these ancient idols are based on "Jōmon dolls". World 4-1 Deep Keep The first level where going underwater is mandatory in order to progress. During this level, the Kongs explore submerged ruins while avoiding many underwater obstacles, such as fish enemies, retractile spikes, and giant fans creating currents. World 4-2 High Tide Ride The third mine cart stage in the game, taking the Kongs into an ancient corridor. The level focuses on switching tracks in order to avoid impediments. Aquatic predators, like Snaggles and Gargantuan Gills, occasionally jump from the water to attack. World 4-3 Amiss Abyss A silhouetted level set in the depths of the ocean. Schools of bioluminescent fish can be swum and corkscrewed into in order to illuminate the area. World 4-4 Irate Eight A level which marks the return of Squiddicus from Donkey Kong Country Returns. The gigantic enemy chases the Kongs through tight passages, impeding them with his arms. Other significant obstacles found throughout the level are Proximity Mines. World 4-5 Sea Stack Attack A level that takes place entirely above water. Bomb-throwing enemies, such as Boom Birds, form the primary danger of the level, along with swaying, spike covered traps operated by Fluffs. World 4-6 Current Capers A level designed around underwater currents. These usually drive urchin globes on set paths, creating basic moving obstacles. World 4-A Rockin' Relics A stage in which the ancient statues, previously seen as only decorations across the island, take larger significance. When powered by electricity, they impel various objects, such as urchin balls and platforms, into the air. World 4-B Shoal Atoll An underwater labyrinth focused on finding five colored keys, one after the other, in order to advance. World 4-K Spinning Spines The fourth Hidden Kong Temple stage of the game, where the Kongs need to travel past series of skewers and platform carousels. World 4-Boss Fugu Face-Off The fourth boss stage in the game and the one to contain a battle against Fugu, the Frightening. The following is extra content that can be unlocked in Sea Breeze Cove. The unlockables can be seen in their respective galleries after selecting the "EXTRAS" option. For a full list of extras in the game, see here. A soundtrack selection for this world can be unlocked after beating Fugu, the Frightening. Deep Keep - Plays during the on-land section of Deep Keep. Funky Waters - Plays during the underwater sections of Deep Keep and Amiss Abyss. A calmer version of "Deep Keep". Irate Eight - Plays during the Squiddicus chase sequence of Irate Eight. Aquatic Ambiance Returns - Plays during the second half of Deep Keep, the majority of Current Capers, and the entirety of Shoal Atoll. It is a cover of "Aquatic Ambiance" from the original Donkey Kong Country, and it is not to be confused with an identically named musical track from Donkey Kong Country Returns, which is a different cover of the original song. German Ozetanien Pun on "Oceania"(? ).